A little bit of salty, a little bit of sweet, a little bit of snap and crunch, a bit of chewy, some soft creaminess, lots of great flavors, and tons of nutrients make this trio of side dishes complete and totally satisfying. Know what else makes them desirable? They're gloriously easy. And another plus? Once again each of the ingredients is a color from the Irish flag making them unexpectedly festive St. Patrick's day treats! You may remember my first Greek Yogurt Parfaits. These ones are similar, but with a couple big flavor changes. 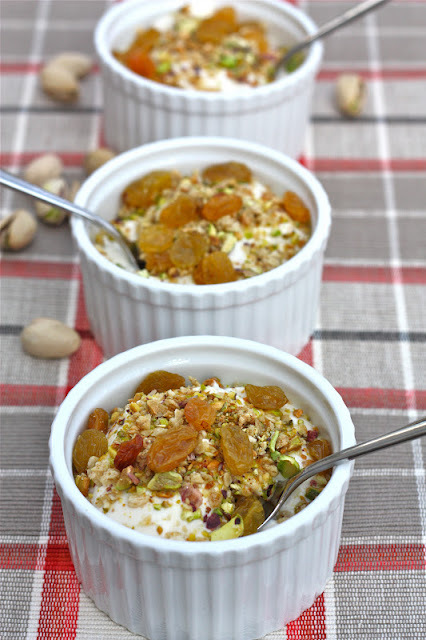 You're already serving pistachios on the side, but we're putting a touch of them in the parfaits as well for some great contrast of flavor and texture. Save some money and shell your own pistachios. The shelled kind often cost more than 2x per ounce than the ones still in the shell. Directions:Combine the honey and yogurt and stir thoroughly until completely mixed. Divide yogurt evenly into 4 serving dishes. Combine granola and crushed pistachios together, and top each serving of granola with as much of the granola mixture as you'd like. Top with dried fruit and serve. Small ramekins are inexpensive and can do a hundred different jobs. I use them for holding yogurt, dipping sauces, mini ice cream sundaes, nuts, candy, and two have a permanent home next to my stove holding kosher salt and ground black pepper for cooking! Nice clicks! I love the raisin topping. Thanks so much! I checked out your site- love the concept, especially since we try to be careful about how much meat we consume. I'll let you know when I try my first recipe of yours!